It's no secret that Hollywood loves a success. The only thing that it loves more than success is duplicating success. So, if something is a box-office smash, you had better believe that producers are going to be falling over one another to find a way to replicate that level of sensation. The key is to do this without being accused of creating a copy or a rip-off. In theory, you want to try and find the key to what made that previous release a hit and distill it for yourself. Or, in the case of The Car, you can simply make an insane movie. For The Car bares a very strong resemblance to another hit thriller, but falls far short of replicating that movie's quality. The tranquil, secluded desert town of Santa Ynez is shaken when two young cyclists and a hitchhiker are attacked by a large, menacing black car. Deputy Sheriff Wade Parent (James Brolin) heads up an investigation to learn who is driving this mysterious vehicle. After a group is assaulted by the car, Wade becomes determined to catch the psychopath behind the wheel. He organizes a group to carry out an elaborate plan to stop the car. (I don't know the following for a fact, but it certainly seems plausible. Remember, this is all speculation.) Following the runaway success of 1975's Jaws, Universal was hungry for another horror hit, but Jaws 2 wasn't due until 1978. So, they had to get something else into the theaters. What if they took the plot of Jaws, moved the action to the desert, and replaced the shark with a car? That would work, right? If you break down The Car, you'll find that the movie has a structure and plot which is very similar to Jaws. The movie opens with young people (who we do not know) being attacked; then, we met a local policeman who has two young children; we learn that the town is planning for a big event; the appearance of the car threatens that event; after enough people die, the main character finally decides that the threat is real and that something must be done. You'll note that the above synopsis is fairly short. That's because there are really no subplots in The Car. The car kills some people and the police decided to stop it. That's about all that we get here. Speaking of Spielberg, Duel had also been a success for Universal, so blending that and Jaws would have to add up to a winner. However, instead of another classic film, we get a classic turkey -- a movie which is simply too ludicrous for its own good. In fact, this movie is so kooky, that I'm not sure where to start. I guess that we should start with The Car itself. It's a big, rectangular Detroit nightmare -- Clearly an American car. But, there's nothing particularly intimidating about it. It's too boxy. To me, a truly scary car would be sleeker. And why are the windows tinted red? Next we have the sheriff's department. Why are there so many deputies for such a small, desolate town? Every time they show the police station, it is simply packed with deputies. It's laughable. Speaking of funny, one can help but giggle when they see the portrait of Wade which is being painted by his girlfriend, Lauren (Kathleen Lloyd). And what's up with her house? Is it in the middle of a highway? And who can forget the scene where The Car flips? Jake and Elwood would blush. Oh, and did I mention that The Car can enter a locked room? We won't begin to ponder who greenlit The Car or why, but it's easy to imagine that there were some good intentions here at one point. However, the script is simply too vague. The movie wants us to accept the fact that The Car is evil. OK, but why did it suddenly show up here and now and start taking victims? The finale offers no answers (but it certainly does go on and on). The scene where we learn one of The Car's weaknesses borders on being creepy, but as there's little follow up, the effect falls flat. The film opens with an on-screen quote from infamous Satanist Anton LaVey. OK, are we to assume that this is the Devil's car? I see the Devil driving something much more European. I can't help but wonder if the script started out as something much more simple, but due to the success of The Exorcist and The Omen, the supernatural was brought into the fold. The Car presents itself as the epitome of mis-guided 70s horror. It's a slick-looking movie which was released by a major studio. It was helmed by a veteran director who had made a famous western and who probably had no business being near a horror movie. It has a touch of the kind of darkness which often haunted movies from this era. (This shows up in a surprise death.) The result is a film which certainly looks good and has some well-done scenes, but wallows in cheesiness. Therefore, it becomes the perfect fodder for a Mystery Science Theater 3000-style party. That way, you can ask the group why a car which intends to prey on people, and presumably sneak up on people, honks its odd horn when it is still miles away. 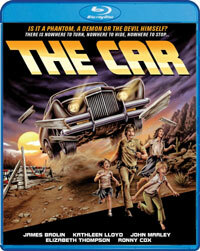 The Car won't be coming to your church wedding on Blu-ray Disc courtesy of Shout! Factory. The film has been letterboxed at 2.35:1 and the Disc contains an AVC 1080p HD transfer which runs at an average of 34 Mbps. The image is sharp and clear, showing only trace amounts of grain and very mild defects from the source materials. Shout! Factory has done a nice job of cleaning up the movie, and it probably hasn't looked this good since it was originally screened. The daytime scenes are nicely bright and show very good colors. The level of detail is good and the depth is notable. I was thoroughly impressed with the video here. The Disc carries a DTS-HD Master Audio 5.1 track which runs at 48 kHz and an average of 3.7 Mbps. The track provides clear dialogue and sound effects. This is better than your average rebuilt mono track, as we get some noticeable stereo and surround effects, most of which come from The Car. There is also some notable sounds from the wind. The subwoofer effects are subtle, but they are there. The Car Blu-ray Disc contains a handful of extras. We start with an "Interview with Director Elliot Silverstein" (9 minutes) immediately confirms my theory that The Car was mean to be "Jaws on land". From the outset, Silverstein begins to make excuses for the film, blaming the studio for forcing him to shoot so many daytime scenes. At least he's honest. "Interview with Actress Geraldine Keams" (12 minutes), who actually had a fairly small role in the film, talks about her career and her experiences on the film. "Interview with Actress Melody Thomas Scott" (12 minutes), who is in the opening sequence, gives a very honest assessment of her few days on the set. The extras are rounded out by the THEATRICAL TRAILER, a TV SPOT, several RADIO SPOTS, and a STILL GALLERY.